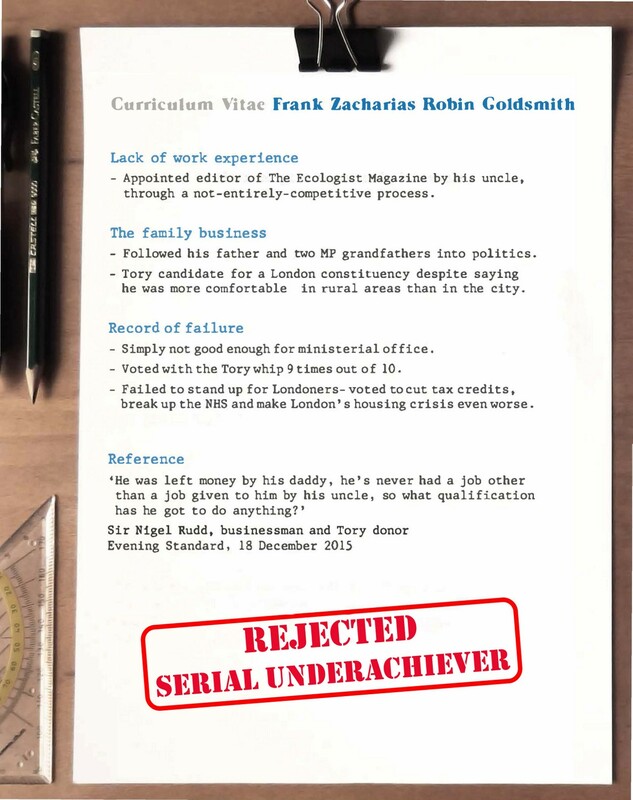 Labour has today (13 January) launched a social media attack ad aimed at Conservative London mayoral candidate Zac Goldsmith, labelling him a "serial underachiever" who "simply isn't up to the job". The ad pushes Labour’s key campaign message about the son of the late billionaire financier James Goldsmith. Just last week, Labour's candidate Sadiq Khan described his opponent on Radio 4’s Today programme as a "serial underachiever" and questioned his real world work experience. 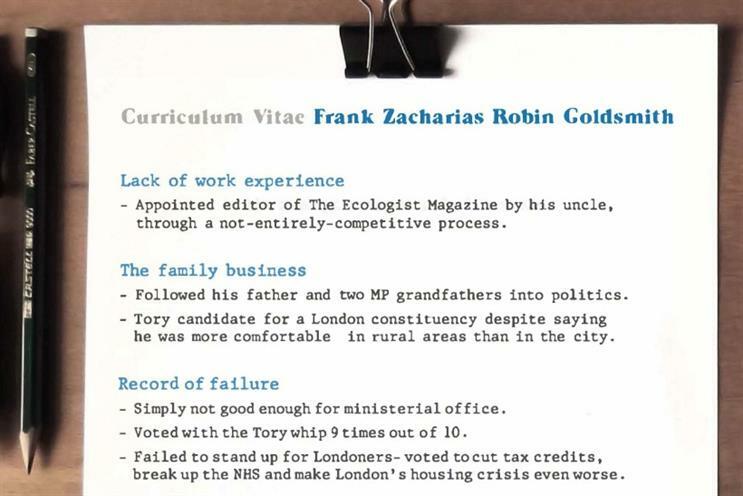 Taking the form of a mock CV for ‘Frank Zacharias Robin Goldsmith’, the ad highlights the fact that Goldsmith's only job before entering politics as Conservative MP for Richmond Park was editing The Ecologist. The magazine was owned by his late uncle Edward Goldsmith at the time, and the ad suggests he got the job "through a not-entirely-competitive process". The ad, which will run on Twitter and Facebook, points out that Goldsmith failed "to win ministerial office - despite voting with the Tory whip nine times out of 10". It also reveals that he became a London MP and is running for Mayor of London despite previously admitting in an interview for 'Tory Radio' in 2006 that he "was more comfortable in rural areas than in the city". Labour also highlighted comments made about Goldsmith before Christmas by businessman and Tory party donor, Sir Nigel Rudd, under the heading 'references'. Rudd said: "He was left money by his daddy, he’s never had a job other than a job given to him by his uncle, so what qualification has he got to do anything?" Despite assurances given by both candidates that the fight to be London’s next mayor would be a clean one, it has descended in mud-slinging in recent weeks. Labour accused Goldsmith’s camp of racism after he branded Khan, a practising Muslim, as "radical and divisive".